One of Four pumps installed during the sewer storm water overflow upgrade process. In conjunction with Robinson Eng. 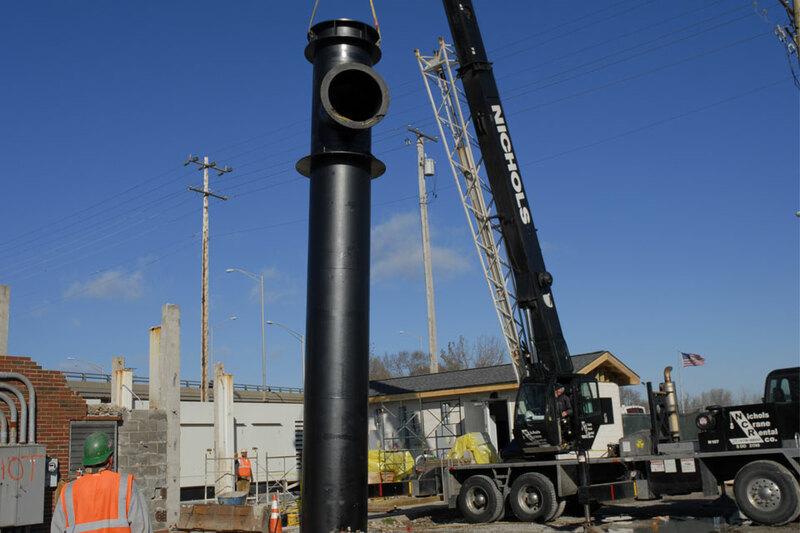 Ltd. of South Holland, Ill., Metropolitan Industries of Romeoville, Ill., assisted in the renovation of a critical combined sewer overflow (CSO) pump station in the south suburban Chicagoland area. The pump station, located in Calumet City, Ill., has been responsible for keeping many of the nearby south suburban municipalities from flooding during heavy rain events since it was originally built with Works Progress Administration money in the 1930s. The station’s reliable operation during high-capacity rain events is imperative due to the negative consequences the surrounding municipalities would face if the storm water is not conveyed to the Calumet River immediately. The city was given three 355-hp pumps and one 215-hp pump, which all discharge at a combined rate of approximately 155,000 gal per minute. It is a large submersible pumping station and one of the larger ones Metropolitan Industries has produced. 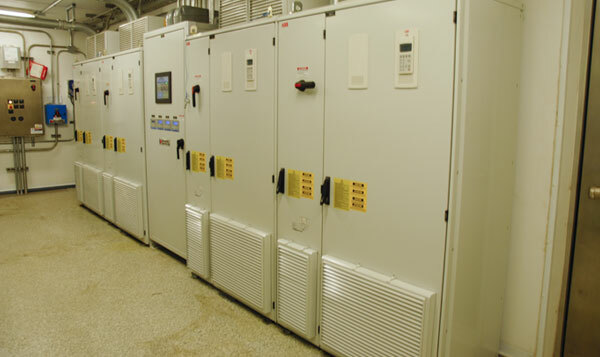 supplied all of the power distribution equipment, controls and motor equipment related to the upgrade, including switch gear (to support existing standby generators) and SCADA equipment, all housed in a prefabricated building. The building houses low-harmonic variable-frequency drives that accelerate or decelerate pump motors to match the influent rate. Regardless of the rainfall event or its severity, the pumps will speed up or slow down to match the influent rate to remove the CSOs in an energy-efficient manner. The building is a complete prefabricated solution and incorporates energy-efficient R-30 insulation to retain heat during the winter and air conditioning during the summer. It measures 36 ft in length, 12 ft in width and approximately 11 ft in height. The pump station is integrated into the city’s master SCADA system to provide notification in the event of any alarm condition and archive important historical operational data. This is critical for a system with such important responsibility. Metropolitan has supplied and supported the city’s SCADA system for many years. Interior of the pump control building. The city’s need for an extensive upgrade of this pump station can be attributed to a number of factors, including corroded power distribution equipment due to hazardous sewer gases accumulating in the 1930s building, and pumping equipment last updated in the 1980s. The existing configuration had suffered a great deal due to the presence of hydrogen sulfide (H2S), which had significantly attacked the copper within the existing power distribution equipment. The original building needed to be demolished and its removal improved the aesthetics as well as upgraded the ventilation. Throughout the entire project, design concepts were developed to take the necessary precautions to prevent H2S from migrating into the new prefabricated control building. 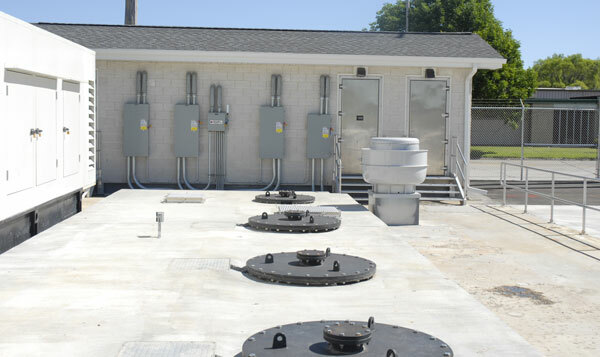 Due to the pump station’s vital nature to the surrounding municipalities, accommodations were arranged to accelerate the installation process. Rather than demolish the existing building and construct a new structure on site, Metropolitan was instructed to prefabricate the new building at its facility in a controlled environment. Once the new building was complete and set in its place, the existing building was demolished. Bypass pumping was required during the installation process because the station’s dependable operation is so critical. Following delivery of the building, the project contractor, John Burns Construction of Orland Park, Ill., added a gabled roof and an aesthetic finish to the structure to match other Calumet City municipal buildings. All operators responsible for maintaining the system also received comprehensive training from Metropolitan.